SAN DIEGO — Last night, I caught a screening of ‘Before Sunrise’ at San Diego’s outdoor movie theater. Cinema Under The Stars is hidden in a courtyard behind Tops, a non-descript hair salon in a quiet corner of the Mission Hills neighborhood. So that’s probably why I never knew San Diego even had an outdoor theater until last night. But walk inside and you’ll see they’ve built a pretty amazing outdoor cinema. With a total of 60 seats, CUTS — my acronym, but maybe it’s an inside joke? — has 34 incredibly comfy “zero gravity lounge chairs”, plus cafe-style seating with chairs and tables in the back. There’s a snack bar with all the treats you need, reserved seats, and a great list of upcoming films. As you wait for the movie start, giant bubbles shoot out from either side of the screen, and each film comes with a short. Last night’s was “Duck Twacy”, an old Looney Tunes where Daffy Duck imagines he’s a crime-fighter. They even provide blankets, in case you get a bit chilly sitting out beneath the stars. It’s an amazing experience. If you’re ever in San Diego, don’t miss it! Is this actual film or are they just showing videos? What a great idea! I wonder how they came up with it. According to some articles on their website, they show DVDs for your $12 ticket. It does sound like a great experience, Patrick; thanks for sharing. To answer Life’s question in general: the open-air cinemas are as old as projection, and in many cities they predated even the nickelodeons as the most casual, tent-sided plots around. They were warm weather entities, obviously, in northern cities but there were at least two of them in Milwaukee alone. Patrick: it looks like a much more sturdy wall there; is that genuine neon glass mounted along the wall? Ah, the luxury of a climate without winter! Such glass tubing in such a position here would not last one snow/ice storm —the reason one doesn’t see more neon up north. Yes, Ken… they’re showing DVDs, but the projection was pretty decent. They have a large screen with proper masking, etc. Looks like a fun way to see a movie. We are going down to Diego County this winter to see Legoland in Carlsbad. We just might make a side trip to see this outdoor theatre and experience the outdoor cinema. Actually, BrooklynJim, the real story of the BBQ “smoking out” the cinema is this: Phil, the owner of Phil’s BBQ, next door to the salon and in front of what was then called the “Garden Cabaret,” is a rather abrasive guy. Although none of the nearby businesses liked him – first because of his smokiness, then his abrasiveness – he spent 10’s of thousands of dollars to reduce the smoke that came from his wildly successful little business. But it was the owner of the salon and cinema who shot himself in the foot when he called the fire department in hopes of catching Phil in a fire code violation or two. During the ensuing inspection, while on the roof of Phil’s, the fire department saw the Garden Cabaret and noticed that it, in fact, was the one in violation of fire codes. 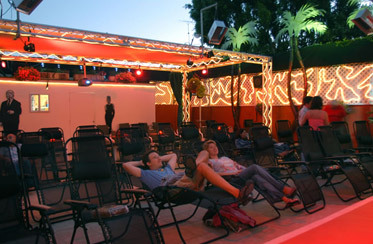 The owner closed that location for several years before remodeling and re-opening as Cinema Under the Stars.